Can the world's quirkiest planetarium be saved? MONICO - The two-ton, 22-foot-diameter globe creaks and groans as it swivels at an angle carefully calibrated to match the Earth's position in the solar system. You're sitting on a circular bench that allows you to lean back and gaze into the blank white dome, accompanied by maybe 20 other people. You're in the Kovac Planetarium, the world's largest mechanical planetarium, and an hour-long astronomy show is about to begin. The planetarium's creator, builder and owner Frank Kovac dims the lights and as the space grows dark, it feels as if he's lifted a curtain to reveal the heavens. The beauty and seeming vastness of it all catches you by surprise and you let out an involuntary gasp: "Ooooh. Wow." About 5,000 stars begin to shine inside the dome. Kovac painted each one using a small brush and glow-in-the-dark paint. He stood on a ladder and dabbed the paint on in the inside of the globe, star by star. Thicker paint made brighter stars. The Milky Way was sponged on. The planetarium is decidedly and charmingly low-tech, built mostly with materials anyone can buy at Menard's —​ plywood, framing lumber and caster wheels. But Kovac used a high-quality fluorescent paint costing hundreds of dollars per gallon to create the stars, making them the most sophisticated — but still decidedly analog — aspect of the Kovac Planetarium. They look so real they seem to twinkle. 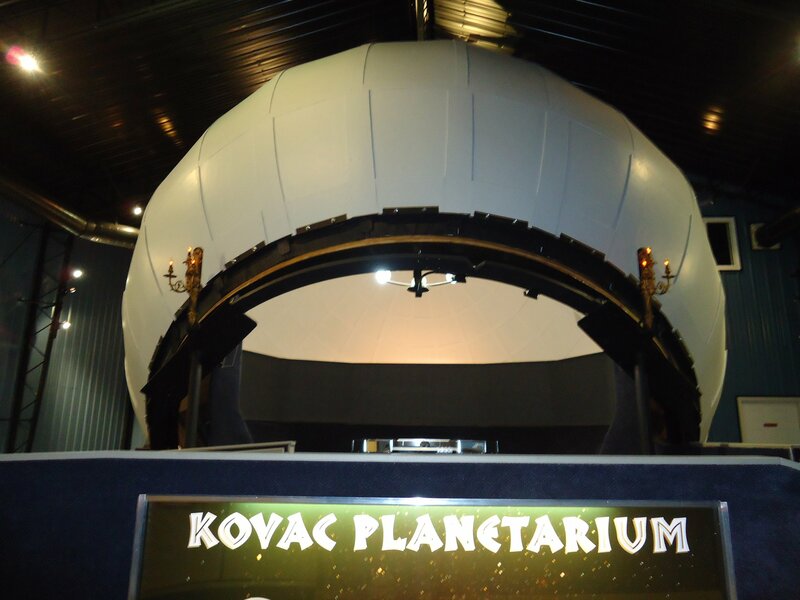 The Kovac Planetarium is located about 20 miles east of Rhinelander, on the edge of heavy tourist country but off the beaten path. The closest town is the unincorporated hamlet of Monico, population 309 in 2010. The planetarium itself is nestled among a cluster of country homes that were built off the gravel Mud Creek Road that winds into the woods north of Highway 8. A series of signs point visitors in the right direction as they move through a series of forks on the road. Even though it's secluded, the Kovac Planetarium, is a tour de force showpiece of amateur engineering, science showmanship and offbeat art. National media outlets such as CBS News, NPR and Popular Mechanics have spotlighted it as a one-of-a-kind destination, and people from all over the real planet have come to visit. But now the Kovac Planetarium faces an existential crisis; as a business it is sinking. Kovac, who lives in a house behind his planetarium, borrowed more than $100,000 to build it. His hope had been to make enough money from admission fees ($12 for adults, $10 for seniors and $8 for children) to pay the debt off. He plays host to groups of 24 at a time, but has no set schedule of shows. People call for reservations, and Kovac schedules shows as called for by demand. Spring and summers are pretty busy, he said, but the slow winter traffic has been hurting his bottom line. If nothing changes, Kovac plans to put his beloved creation, including the land and his home, up for sale sometime during the summer or early fall. "I don't really want to sell it, but I might be forced to," Kovac said. "I followed my dream, and now it's a mountain of debt." When you look up at the night skies in Wisconsin's Northwoods, it opens your imagination. The light pollution is minimal up there, and you can see the band of the Milky Way. If you're lucky, you can see the northern lights shimmering off in the horizon. It gets you wondering about your purpose and place in the universe. It's that kind of thinking that energizes Kovac and led him into his own personal brand of obsession. The 51-year-old Kovac built the planetarium itself over the course of five years, from 1997 to 2002. He worked at a Rhinelander paper mill at the time, and he did the bulk of the planetarium construction on his own during his off hours. He enlisted friends, coworkers and neighbors when he needed outside expertise or a helping hand. The planetarium itself is fascinating because of its basic design and construction, an artisan throwback to old-school carpentry skills. The round globe with the open bottom was built using lumber as a frame and plywood sheathing, a series of 24 long panels with arcs for sides. Those panels bend together to form a sphere. The globe sits on a tilted base, and the base sits on a series of wheels allowing it to swivel on its axis. It's driven by a single electric motor and a wheel that abuts the base of the globe. Friction between the motor, the wheel and the globe's base turns the globe. The entire machine is stabilized by a cable that is attached to the roof of the building that surrounds the planetarium. The planetarium, which stands about two stories high, can hold groups of about 24 people. Kovac, a youthful, trim man with a soft voice and low-key manner, used the construction skills he learned from high school shop classes, a stint in the U.S. Air Force and working in the paper mill to build the project. It was done without any formal plans, he said, but he had a vision in his mind about what he wanted the planetarium to be. The planetarium design is a loose mashup of concepts he gleaned from old-school sky maps, globes and his experience of painting stars on his bedroom ceiling when he was a kid. "It's basically taking a map of the stars and making it big enough to get people inside," Kovac said. Kovac grew up in Chicago, where his father was a doorman and a maintenance worker in a downtown building. The elder Kovac, Frank Sr., encouraged his son to work with his hands and his mind. When Frank Kovac Sr. gave his son a telescope, the boy saw the moon close up and something clicked. "You know, you look at the moon, and you see the craters. But there's more beyond the moon. Then I was thinking about how big the sun is compared to Earth and then other stars out there," Kovac said. The 1980 TV miniseries "Cosmos" by Carl Sagan magnified the allure of space when he was a young teenager. Since then, Kovac's head, heart and spirit have always been among the stars. "It's just the wonder of the vastness out there," Kovac said. The Air Force brought him to the Upper Peninsula of Michigan in the late 1980s. He found the northern sky so beguiling that he looked for work in the Northwoods, eventually landing a job at the paper mill. He bought his piece of property out in the middle of nowhere to enable even more stargazing. Kovac loved astronomy so much he felt compelled to share and teach others, and he became a kind of astronomy evangelist. He began giving star watching lessons. It was cloudy one night in 1996 when he spoke to a group of Boy Scouts, and it's hard to imagine that they were more disappointed than he was at not being able to see the constellations. The idea for the Kovac Planetarium was born. "I envisioned this all before it was here," Kovac said. Kovac is single and has never been married. "I don't know of anybody who would have put up with me, with all this," he said, waving a hand around the planetarium. In a sense, the community of visitors to his planetarium is his family. As a machine, the Kovac Planetarium is enthralling. "It's primitive, but complex. This is quite a feat. I'm impressed," said Barry Morgan of Merrill, an engineer who is a project manager for AGRA Industries of Merrill, which produces buildings and storage tanks for feed, seed and fertilizer mills and for bio-mass fuel producers. He and his family were visiting the planetarium for one of Kovac's late March Saturday afternoon shows. Morgan isn't the only one. Kovac recently played host to a youth group that aims to help kids find careers and motivate them to excel. He told them about the building process, highlighting the hard work and resilience it took to make his dream a reality. The idea, he said, was to provide a role model and inspiration. Morgan visited the Kovac Planetarium on a Saturday afternoon in late March. He and his wife, Kelli, were accompanied by their four sons, Ian, 11; Seth, 9; Jameson, 7; and Vince, 5. Kelli had seen some YouTube videos about the planetarium and wanted the boys to see it firsthand. The building that houses the planetarium is comfortable. There are bathrooms, air conditioning and heating. Kovac decorated with a variety of items designed to stimulate minds, mostly aimed at children. There are models of the solar system, for example, and inspirational posters. One of Kovac's favorite items is a poster of Einstein, with a quote attributed to him: "Imagination is more important than knowledge." "My mother gave me that poster," Kovac said. "See how he's looking at the planetarium and smiling? Of course, it's not totally true. Knowledge is important, too." Kovac's astronomy shows last about an hour. He uses the planetarium to speak about the vastness of the universe, explaining and showing different planets and stars. He points out constellations. He explains the significance of the North Star. His presentation is peppered with droll jokes. One example: "Gravity always gets me down." It's like sitting in a classroom with a favorite teacher who is showing a cool experiment. Kovac speaks without notes. But he will use a small laptop to project short films, mostly from NASA, and images. The overriding theme of each presentation, of the entire endeavor, is to stir the curiosity of visitors of all ages, but especially children. As he completed his March show, Kovac sent his audience off by urging them to get curious about space. "We have the quest for knowledge," he said. "So go out and sit in a lawn chair and look at the night sky. You don't need a lot of fancy equipment. Even a pair of binoculars can help you see planets and the moon." The idea that Kovac would have to sell and leave the Kovac Planetarium is heartbreaking. He's not exactly sure when he will put the property up for sale. He's begun casting about for real estate agents, and he has his own ideas about what could happen to the planetarium. Ideally, he would find a buyer who would allow him to continue giving the tours and presentations. "I would love to be involved somehow," he said. At the very least, the buyer should have to have an appreciation of what the planetarium is and what it means. Kovac has a deep pride in what he's built, and he should. He had an idea; he worked long and hard to see it come to fruition. And it turned out better than he could have hoped. "It's a work of art now," Kovac said. "People say it's an engineering masterpiece. There is no other one like it in the world." The Kovac Planetarium is located at 2392 Mud Creek Road, about four miles east of Monico on Highway 8. People can call the planetarium at 715-487-4411 to find out showtimes, which can vary, and to make reservations, which are required. Tickets are $12 for adults, $10 for senior citizens ages 62 and older and $8 for children ages 5 to 12. For more information about the planetarium, visit kovacplanetarium.com.